Home » Hypotonia » HYPOTONIA is also known as LOW MUSCLE TONE. HYPOTONIA is also known as LOW MUSCLE TONE. Contents this page on Hypotonia: 1… The Understandable Definition of Low Muscle Tone, Hypotonia, is crucial. — 2… The effects of Hypotonia and the Treatmnents for Hypotonia. — 3… Overcoming Hypotonia —4… What Causes hypotonia / Low Muscle Tone? — 5… The Intelligence of those with Hypotonia or Low Muscle Tone. WHAT IS HYPOTONIA? WHAT IS LOW MUSCLE TONE? The definition of hypotonia is low muscle tone. In Down Syndrome and many other conditions, hypotonia is one of the typical features – nearly everyone with Down Syndrome, for example, has low muscle tone as well. Hypotonia can affect kids to different extents. For some babies the symptoms of low muscle tone are obvious from birth, while for others the hypotonia is invisible for the parent to see: Your kid seems perfectly good with their muscles – they are strong, they run round with boundless energy, but they have trouble doing things. You have likely been given the standard explanation about your kid’s muscles being floppy and you just cannot see it in your kid. For five years, I reckoned the physiotherapists were just not making sense describing my son, Jacob, as having low muscle tone. So, after getting the stock standard definition when I asked the new physiotherapist what hypotonia was, I pushed in a lot harder until I got an explanation of low muscle tone that made sense to me. Essentially hypotonia can be defined as the muscles lacking stamina. The muscles don’t have the energy to keep working to a normal level. So your kid may seem to do everything just fine, but keep the same muscles working for any length of time and they will tire faster than a normal person’s muscles. I found out from a visiting physiotherapist from the Adelaide Womens and Childrens Hospital, that muscle tone comprises a second feature, which is the speed of the muscles’ responses. The speed is slower in those with hypotonia. Due to the speed of the muscle response being slower, kids with hypotonia have trouble keeping up with the speed and agility of similiarly aged kids. For example, with jumping off steps, kids with hypotonia will often land in the frog position, as their muscles cannot respond fast enough to keep them on two feet. The higher you go for the jump down, the more likely the frog position, as the muscles have to adjust due to the free fall changing the body position rapidly in flight. Another example is with running – wider gait and leaning forward is typical of those with hypotonia. The low muscle tone means they learn to adjust: Wider gait helps those with hypotonia to be more stable at faster and slower speeds, while the forward leaning – I think, but am not sure – helps to keep them propelling forward. On a more positive note, because hypotonia is also related to the speed of nerve impulses and so on, hypotonia will tend to DECREASE in severity as a kid reaches nine years of age. At nine years of age, most of the neurons have developed fully ( have completed the mylenation process ), giving rise to faster neuron responses, which helps the muscles to move faster and allows the kid with hypotonia to perform faster and better. When you consider how muscles are tied to every physical endeavour we do, from eating, to talking, to facial gestures, to just sitting still, you can then start to appreciate the significance this has to an individual suffering from hypotonia. Hypotonia is devastating, more so in the earlier years of life. Hypotonia occurs in every muscle, so any activity that requires muscles is likely to be impaired. Speech is likely to be delayed and speech therapists needed. Walking, sitting, crawling will be delayed, requiring help from physiotherapists, while fine motor movement for picking things up, drawing with a pencil will be delayed requiringoccupatiotional therapist assistance. Yes, your physiotherapist will give you exercises to do with your kid for the hypotonia – they will sometimes work hands on with your kid individually, sometimes your kid will be seen in a group along with kids of similiar age who also have hypotonia. Even though muscles and balance may be made stronger and better, the muscle’s stamina improves only slowly and not by a great deal in those with hypotonia. There is not one drug or nutrient that can help, high calorie foods cannot improve the stamina of the muscles, but we can help the neurons along a bit, as you will find out as you read on. Hypotonia is quite devastating even though it can almost be invisble to a parent. Even the floppiness that you hear the professionals talk about, for example, is because the muscles, as a result of the hypotonia, are much less supportive of the skeleton, so the joints of the bones are not held together by the muscles as well as they should be, so you are often told your kid has hypermobility as well – which simply means the joints move excessively in comparison to other peoples’ joints. Jacob, for example, can do the splits very easily and bend himself into positions that make me cringe – his muscles just are not providing the support to the joints to prevent excessive movement. 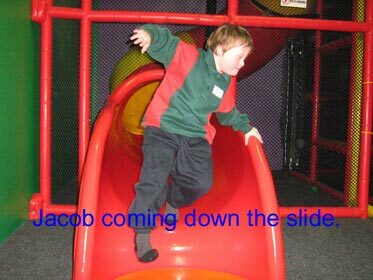 As a result, Jacob will also be more likely to develop arthritic conditions as a result of the damage to the joints that hypermobility causes over an extended time. What we can do for our kids with low muscle tone, in this regard, is discourage them from over bending their joints – on a side note to this, often when they are old enough to realise they have this special ability, they want to show it off, but it does need to be discouraged. Low muscle tone is a condition that people primarily have to learn to live with. However, although the stamina side of hypotonia is difficult to alter, we have been using a product called Efalex with Jacob, which contains oils, such as fish oil, that helps neurons. In this photo of Jacob, you can see that the hypotonia has not stopped him from having fun. Running down the slide like that takes a good deal of balance and his muscles appear to be coping quite well with the rapidly changing body position. What this means, is that at 7 years of age, Jacob has his hypotonia well under control and is able to enjoy the same activities as his peers. Jacob also has good soccer ball skills – learning to play soccer is considered a therapeutic activity for kids with hypotonia, as it helps teach muscle control and balance. Over the years kids will learn to live with their hypotonia: They will tend to avoid games that involve physical exertion, as they just cannot keep up with their peers. So non-competitive physical activities are going to be much more appealing. School may be hard initially. Jacob, after about three hours in kindergarten, is frequently lying on the floor, worn out – prolonged sitting while listening to stories, practising writing and drawing, wears the muscles out – lets face it, school demands an awful lot of sitting. With low muscle tone, learning to endure the tiredness is more what adjustment to their life is about. It’s hard to learn new stuff and do well academically when you’re constantly tired and wanting to rest and or sleep. So much school work may not be learned because of tiredness, which in turn means lower school performance. If that wasn’t enough, the longer the test or exam, including intelligence tests, the worse the expected score likely to be achieved. Low muscle tone can lead to under performance / under achievement in the school if we are not alert. Just thought I’d let you know, that Jacob, after spending almost 18 months in kindergarten, no longer shows himself to be overtired at the end of each session. The hypotonia is something he is successfully learning to deal with. Also, the school is learning how to teach Jacob more effectively through being flexible with routines – if Jacob appears tired in one activity, he is moved onto a different activity which is more appropriate at that time for him. This is a valuable point to remember about low muscle tone – the sufferer can often be assisted by modifying the environment. The cause of hypotonia can be difficult to diagnose . I remember reading that it can have 1000’s of causes and quite often you will end up having your kid undergo tests for months on end without a cause ever being found for the low muscle tone. Obviously, if your kid or baby has Down Syndrome, or any other condition, that condition will likely be seen as the cause of the hypotonia. 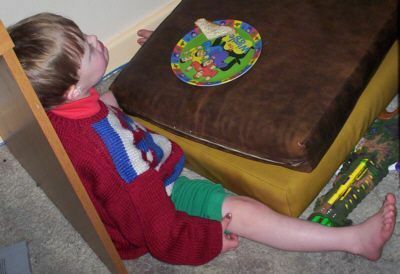 It should be noted that hypotonia, although generally related to low intelligence / IQ, it’s sufferers’ may have normal or higher intelligence when NO other intellectually disabling condition is obvious, such as Down Syndrome. Remember, if you want to come back to this low muscle tone web page again, please book mark it now or add it to your favourites now! 4 Responses to "HYPOTONIA is also known as LOW MUSCLE TONE." My grandson was born 2 months prematurely in October 2013. Although he has had constant medical monitoring for choking related issues and all-around check-ups, no one had suggested low tone. However, it is slowly dawning on me that he has it and I’m struggling to think how I can tell my daughter. I know in the way he bobbles his head and how his feet move constantly and when you hold him close he doesn’t lift his arms to you and he doesn’t seem to have a core or center of gravity. Given your observations, I am surprised that doctors and allied health professionals haven’t noticed the symptoms. Yes, it may be of some benefit to the child to suggest having this condition checked out to the parents. If you feel uncomfortable with doing that, then you could see the doctor yourself and ask if it could be a possibility Suggestions only of course, but hope that helps you. I am in my 50’s and just realized I’ve been living with Hypotonia my entire life. I was looking at websites to see why my grandson isn’t talking yet, and when I came to one about Hypotonia, I instantly recognized every single symptom in myself. I wondered all my life why I had such poor, rounded posture and why it was physically painful to sit up straight for more than a short period of time (like doing a hard exercise). I also always wondered why I couldn’t do the things other kids could do despite trying so hard, I just didn’t have the strength they did. I’ve got every characteristic, being able to bend my fingers and thumb all the way back, the skinny calves from locking knees, and I recently dug out my old baby book to see when I began walking, and of course I was a late walker. I remember my mom, who has since passed away, always saying she was double jointed. I realize now she had Hypotonia as well. My mom had arthritis really bad when she got older, and now that I’m in my 50’s I’m starting to have some joint pain in my hips. But other than that, I’ve lived a completely normal life. It’s true that you learn to adjust. I just always thought that was just the way I was, I never realized I had a “condition”, and honestly, I’m glad about that. I think that would have made me feel more different than I already did. I just thought I was a weakling and unathletic, which I attributed to how thin I was. Who would have thought, that after all these years, you finally find out. Detection rates have improved out of sight and now-a-days it is picked up at birth. Hope the arthritis goes no further, and may be worthwhile enlightening your health professionals about it too. Copyright © 2000-present Donald Urquhart. All Rights Reserved. All universal rights reserved. Designated trademarks and brands are the property of their respective owners. Use of this Web site constitutes acceptance of our legal disclaimer. Hi, if you want to contribute financially to say thank you or help us build this site up with even more content, just click the donation button below. Thank you. Donald. Want more information on Down Syndrome here? Just email with your question. Please note that due to increasing pressures and demands, that we are often unable to respond to individual emails. But first, if you want to come back to this Down Syndrome web site at www.cdadc.com, just add it to your bookmarks or favorites now! Then you'll find it easy!